Welcome Inventors - Can We Be of Assistance? If you are an inventor in Central Florida looking for guidance on how to move forward with your invention, you have found the place! 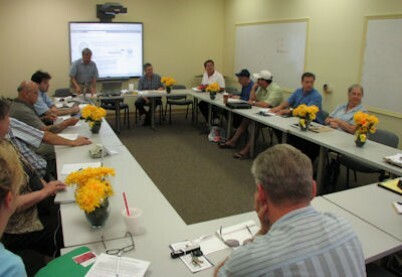 The Inventors Council of Central Florida is where inventors meet monthly to discuss their inventions. We are a completely volunteer organization with the objective of helping you bring your idea to reality. We can help you without compromising the privacy of your idea. A one-dollar donation is collected at the beginning of each meeting, which helps to cover administrative costs. Be sure to check out our other pages to see what resources you can use now. About Us explains who we are. Meetings/ Membership gives the particulars of our next meeting and is where you can register as a member. Calendar is a calendar of events looking ahead at least 6 months. Current Information is how we keep you up to date on events and current subjects. Look here for notices of trade shows and other events of interest. There is also a place to review the informative emails which have been sent to members. Resources is a compendium of stuff to assist in the invention process. Our Members is a listing of public information about products developed by our members. Our Products shows what is getting to market. Testimonials is where you can share how ICCF helped you. Submit Your Helpful Information is where you can find instructions and links to submit information you have found helpful and want to share it with everyone else. Members Only is where you can download forms such as NDAs, surveys, business cards and a list of 82 patent agents in the Central Florida Area. Login Information is distributed with the meeting notice emails. If you do not have an email address you will need to contact one of our officers to get the password. Contact Us is where you can send messages to us via email. Store is a link to a customized Amazon.com store to buy supplies. Click on the link below to get a full page ICCF flyer. Read about Green Energy and its Suppresion. This is also a great list of what has been accomplished, with references. Our Mission is to provide a secure environment for inventors to submit their ideas for critical peer review and to nurture our members by providing guidance in making ideas profitable. ICCF is a 501(c)(3) which makes your donations deductable. ICCF could not exist without the support of local businesses as a 501(c)(3) your donations are deductable on your federal income tax. Here are some who have made significant contributions to the operation of ICCF. Please help them by liking them and otherwise making others aware of them. If you would like to be a sponsor please contact us with your offer of help by clicking here. A Petition for a Writ of Certiorari (request for review of a court decision) has been filed asking the question, "Whether, under the Leahy-Smith America Invents Act, an inventor’s sale of an invention to a third party that is obligated to keep the invention confidential qualifies as prior art for purposes of determining the patentability of the invention." has been filed. Download document here. This is an example of how the courts completely ignore issued law for the benefit of big companies. Essentially, the court has previously determined that somehow private transactions are public disclosure and starts the clock on your invention. The petition is an attempt to change that. Also contact your representatives and tell them how important this is to you.